The proyect that it is been developed by the VG MotorSport team has as goal the design, fabrication, fine tunning and consequent performance tests of a racing motorcycle in the MotoStudent 2018 competition. The above-mentioned proyect will be carried out by the students from different faculties from de Álava campus, with the aim of extending and complementing their studies. The MotoStudent competition is a academic challenge between scholars from all over the world. 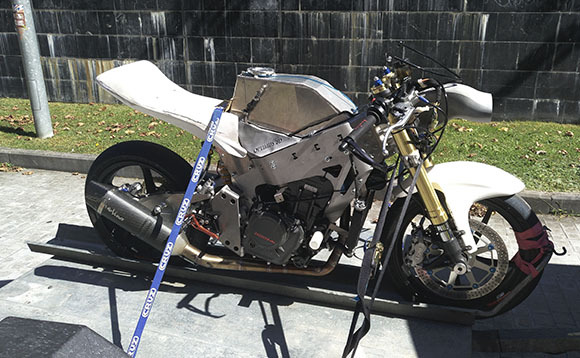 The primordial goal of this challenge is to: design, build up and evaluate a motorcycle prototipe, that will be tried out in the Motorland Aragón circuit; where this prototipe is going to take part in the gasoline category, with a four-strike 250 cc engine. In this affair the students have the opportunity to take part in a real proyect, with real compromises. Among other things, it will give them the experience of working in teams, new capacities related to design and fabrication (CAD design, finite element calculus…), the management and administration of different means (monetarial, physical…); and moreover, having to deal with deadlines set up by the organization. What is more, it brings the opportunity to work in a business environment, as they have to deal with companies and institutions. During the development of the motorbike, it is pretended to work straight with ocal industry, so that it has a place to put their products tested. Furthermore, it is a chance so that the companies that collaborate announce their products and services by means of publicity widespreaded through the team itself and in the competition with an advertasing stand. Taking this into acount, the companies are going to be able to expose their brand in an international competition. Similarly, it is a very good chance to meet university scholars that have a potential to become future employees. In the case of the collaboration that it is been done between the VG-MotorSport team and Optimus3D, this last company makes posible to manufacture the Ramair-Airbox system. This system is based on redirectioning the air that impacts in the frontal part of the motorbike into the admission of the engine, so that the air increases the pressure of the admitied air. In this way, as the pressure rises, the density of the air also increases; and by each volume unity that is redirected to the combustion chamber there are more oxygen molecules, leading to a more efficient combustion. The system that redirects the air to the engine is Ramair-Airbox system (In red) called Ramair, and beside the engine a hollow compartment is been put to stock the air, called Airbox. The shot that it is been given working with Optimus3D is the fact that pieces with difficult geometries can be made, that otherwise with other techniques would be impossible to. As it is a system that works with a fluid, it has to have the less edges as possible, to minimize the losses, so the usual production processes are not the best ones for this kind of works. Moreover the pieces have to be hollowed, where with other methods would be a waste of time and material. All of this pieces are being made in Polyamid-12 as it is needed a rigid, waterthight material that can be put into a 120ºC temperature without deforming. By last, to check the dimensions and to verify the correct assembly of the motorbike some of the pieces have been produced firstly in PLA with FDM technology that has been very important to not missproduce parts.